Intendix is the first thought-to-type system you can buy that's ready to use out of the package. BCI is going commercial. About time. The world’s first patient-ready and commercially available brain computer interface just arrived at CeBIT 2010. 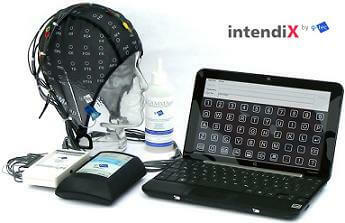 The Intendix from Guger Technologies (g*tec) is a system that uses an EEG cap to measure brain activity in order to let you type with your thoughts. Meant to work with those with locked-in syndrome, or other disabilities, Intendix is simple enough to use after just 10 minutes of training. You simply focus on a grid of letters as they flash. When your desired letter lights up, brain activity spikes and Intendix types it. As users master the system, a few will be able to type as quickly as 1 letter a second. Besides typing, it can also trigger alarms, convert text to speech, print, copy, or email. Retailing for €9000 (~$12,250), Intendix isn’t cheap, but it’s the first thought to type system available that’s geared towards easy to setup personal use in the home. Brain computer interfaces just got more accessible, and that’s a step towards them becoming more common all over the world. Check out videos of Intendix after the break. As Kurzweil mentioned in his speech about BCI to the MIT XPrize Lab, EEGs are limited in their applications. They have great temporal resolution, but spatially they lack the precision needed to really translate your thoughts into computer actions in a way that exceeds our current keyboard and mouse system. Eventually, we will need to know more than which centers of the brain are active, we’ll need to know about neocortical columns or even individual neurons. That may mean directly wiring electrodes into the brain. We’ve seen success in that arena already, both with speech and motor controls. Of course, there could be better sensing technology that allows precise spatial and temporal resolution without sticking wires in your head. Projects like the BCI X Prize are aiming to develop them soon. No matter how the computers of the future will read our thoughts, there’s little doubt that they’ll be communicating directly with our brains. Controlling the digital world will become much more intuitive when we can simply think commands to our devices. With the interconnectivity of social networks and electronic communication, that also means we’ll be able to talk with each other through our thoughts to some degree. The next generation’s Twitter could be broadcasting what we’re thinking. Literally. That level of BCI technology is fairly far off on the horizon, however. Right now we have Intendix; the ability to go to a store, buy a device, and start typing with my thoughts is enough to keep me happy for a while.